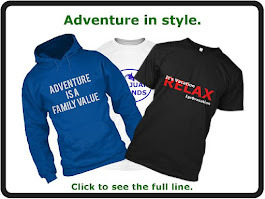 Lodging is one of the biggest expenses you will encounter when planning a vacation. As I planned our Southern Utah vacation I selected the places we wanted to visit and then began the search for lodging. We planned to visit Zion National Park and Bryce Canyon National Park. If there was time, we would also try to make it to Grand Staircase and Cedar Breaks National Monument. Where would we stay? Ideally, if money were no object, we would have stayed in the town of Springdale, Utah which is home to Zion National Park. However, lodging in Springdale is quite expensive. 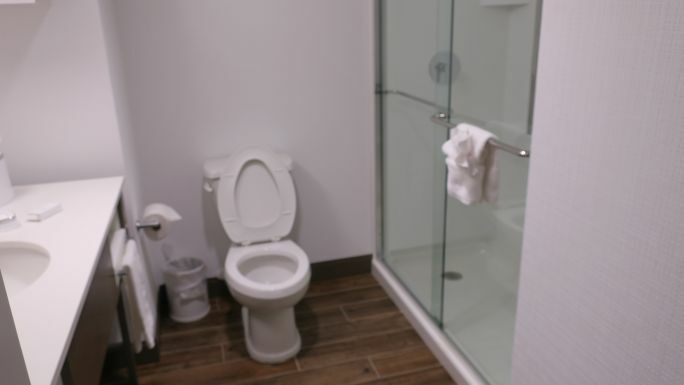 At the time of our trip, the Hampton Inn in Springdale, Utah was $280 per night. Bryce Canyon Grand Hotel Best Western in Bryce, Utah was $248 per night. I even looked at Broken Spur Inn in Torrey, Utah to discover that would cost us $277 per night. I also tried to get lodging at Bryce Canyon Lodge but by the time I tried to book it there was no vacancy. (Not to mention it was a bit pricey as most national park lodges tend to be.) We would stay five nights so the cost for lodging was a concern. Needless to say, I had to expand my search for hotels. I narrowed the options to Hurricane, Cedar City, & St. George, Utah. I chose St. George because there were more choices for hotels and restaurants. St. George has a population around 83,000. It is located in the southwest corner of Utah approximately 1 hour and 45 minutes from Las Vegas, Nevada, 50 minutes to Zion National Park, 2 hours and 15 minutes to Bryce Canyon National Park, and 1 hour 15 minutes to Cedar Breaks National Monument. Our plan was to visit Zion National Park for two days, Bryce Canyon National Park one day, and Cedar Breaks National Monument for one day. I realize St. George is not near Bryce Canyon National Park so that would be our driving tour day. We had great weather for a scenic drive which is a good thing since we spent five hours in the car traveling to/from our hotel in St. George. The drive to Zion & Cedar Breaks was not a problem at all. The roads were good and we enjoyed the scenery. 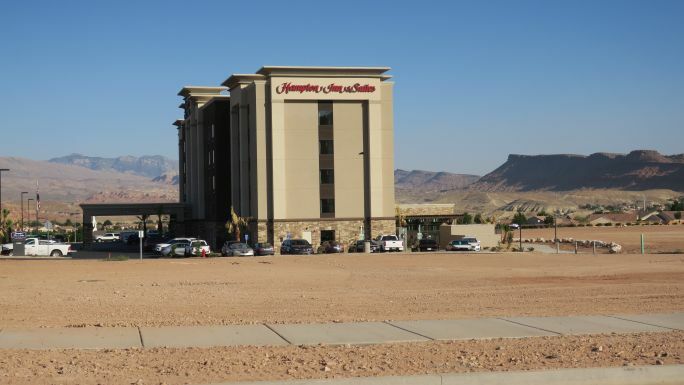 The hotel I selected in St. George was a brand new Hampton Inn and Suites located outside of St. George on Sun River Parkway. I was able to get my room for $100 per night plus tax. That was one third of the cost of staying closer to the national parks. Even though we had to drive a little more, it was well worth it when you consider I could stay nearly 3 nights in St. George for what 1 night in Springdale, Bryce, or Torrey would cost me. I liked the location because it was quiet and had easy access to the freeway. However it is in a developing area so there is a lot of undeveloped land surrounding the hotel. We stayed on the top floor in room 504 with 2 queen beds. I really liked how Hilton let me choose my room with my Hilton app the day before my arrival. 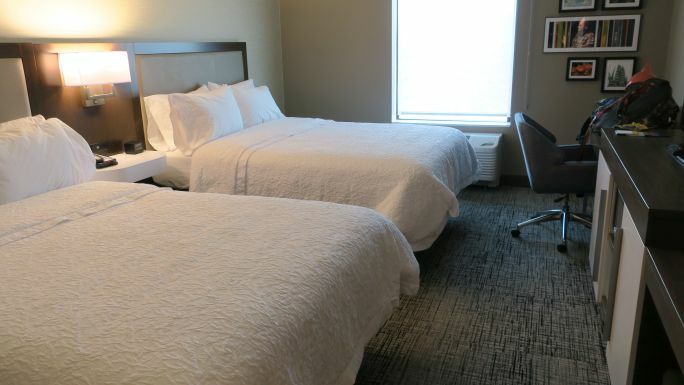 The room was clean and the beds were comfortable. I found it to be much like most of the Hampton Inns we have visited in the past. I will say the rooms were smaller than what I expected. It was not uncomfortably smaller, but I think they could have made the room an additional 40+ square feet for added comfort. I would have liked a chair in addition to the desk chair for extra seating. Other than that, the room was fine. Some things I liked about the room include the large walk-in shower. I don't like bathtubs in hotels as I don't plan to take a bath when I am traveling. I much prefer showers. I also liked the mini refrigerator which was great for keeping drinks and snacks. I liked there was a microwave for the morning we had breakfast in our room because we headed out to the Narrows at Zion National Park at 5 AM. This might sound funny but I also liked the shade on the window. I am not much of a fan of the drapes older hotels have. The shade pictured below is without the privacy shade that pulls down over the one pictured. During our stay on Monday - Wednesday nights an evening social they called Snack Time was offered. One night they offered donuts. The next night was tacos. The third night was hot dogs. Unfortunately we never got back to the hotel in time to enjoy Snack Time so I don't know if it was any good. 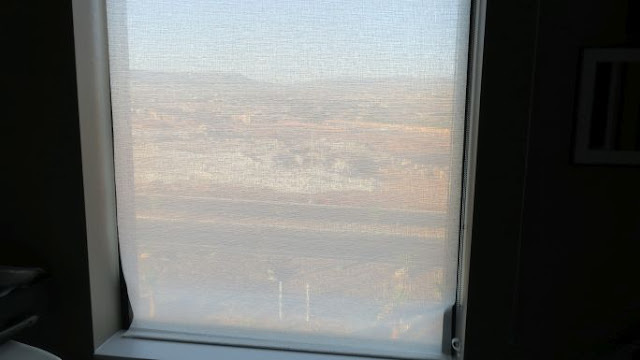 The air conditioner worked great, which was especially important since the high temperatures in St. George during our stay hovered around the 107 degree mark. I also liked the hotel had an indoor pool. One thing the indoor pool had that other hotels I have stayed at with indoor pools did not have is a unique design of the pool room. The pool room was surrounded by windows that opened up like a door. 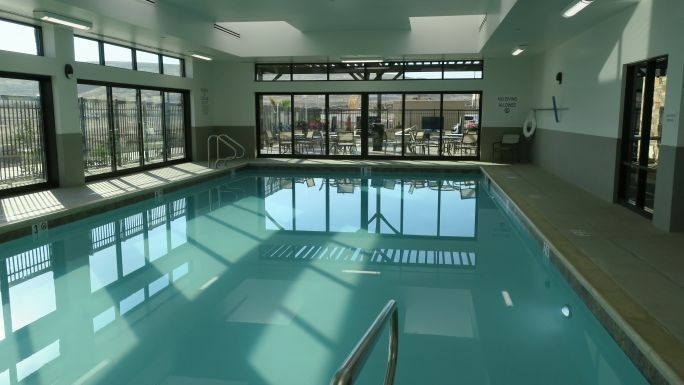 You have the advantage of an indoor pool without having to deal with the strong chemical smell. 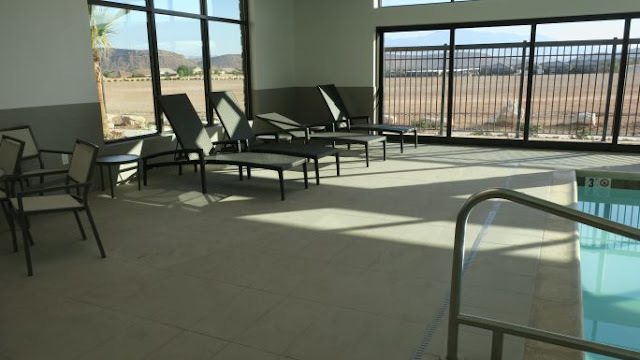 There is an outdoor patio located adjacent to the pool room that has a fire pit and patio tables and chairs. We spent five nights at the Hampton Inn & Suites on Sun River Parkway in St. George, Utah. We enjoyed our stay and would recommend it to others who are visiting the area. 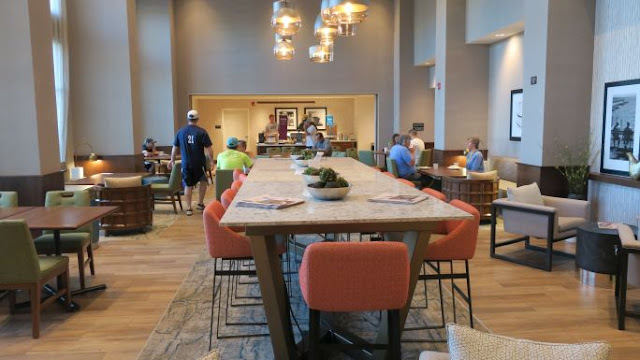 I suppose the only thing I might have done differently would have been to book a room at the Bryce Canyon Lodge for one or two nights and then the other two nights I would have stayed at the Hampton Inn & Suites St. George. I really liked the look of the lodge at Bryce Canyon and would have liked to have stayed there...maybe next time. I hope this blog post helped you plan your southern Utah vacation. Wherever the road may lead, may God bless you each mile of your journey.